Have a bunch of Notifications and Alerts sitting on the lock screen of your iPhone or iPad that you don’t want on there anymore, but don’t want to unlock the device or leave the lock screen? No sweat, rather than swiping to unlock the iOS device and then manually addressing the notifications, you can shuffle them all away and store them into Notification Center where they belong, immediately clearing off the lock screen without ever leaving it. Done, you now have a clear iOS lock screen again. This is a great trick to use if you don’t want to go all out to hide the notifications or disable the lock screen alerts. It’s also helpful if you get a notification you don’t want others to see, because you can quickly swipe up and down to collect it back into notification center. 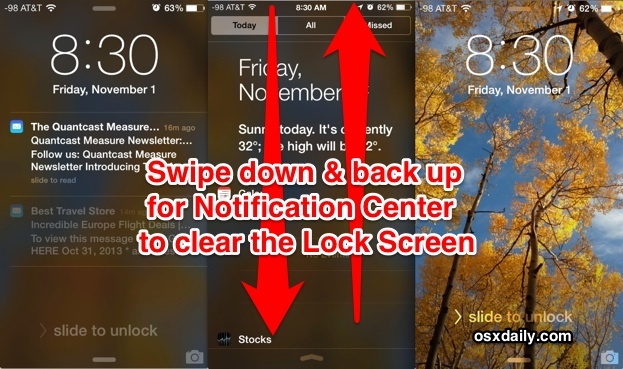 This works for every type of alert or notification residing on the iOS 7 (or newer) lock screen, though you’ll obviously need to have lock screen access of Notifications and Notification Center enabled in the settings to be able to use it. Don’t forget to customize “Today View” as well, it’s the first screen you see when accessing the panel and you can tune it to fit the needs of what you want to see. This great little trick comes to us from CultOfMac, who mentions they had to tap the “Missed” tab to get it to work, though in testing just a super quick swipe down and up worked fine to get the job done.